I'm still living/buying ethically - meaning I'm trying to only buy second-hand/thrift. I'm loving depop for buying but I struggle to sell anything on there. Does anyone have any other recommendations, except eBay? Anyway, I didn't buy much in January because I am skint after not being able to work full time, however, I did grab a couple of pieces! First up I blagged this cute black crop top with purple glitter sea shells on along with this coffin shaped brush bag/holder with a unicorn on - I think these were £10 bundled together from the same seller! 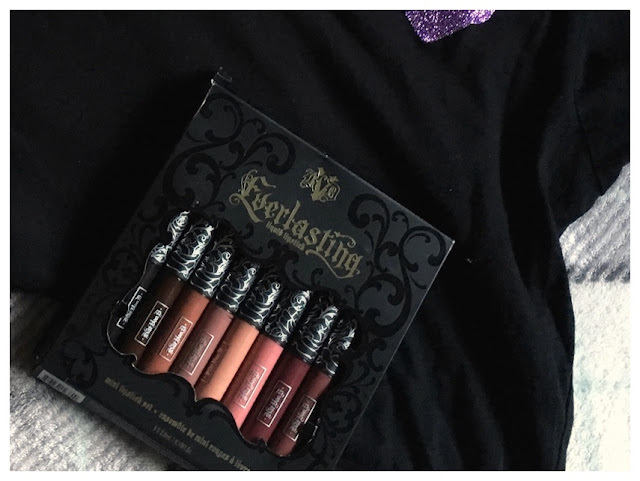 Super luckily I managed to find the Kat Von D Everlasting Mini Liquid Lip Set which retails for £42 on depop brand new and unopened for £28 including postage. I wasn't sure exactly how big these were, though I knew they weren't full size. I have a LOT of lipstick and I don't think I've ever finished one, so I figured these smaller ones would actually probably be better, as I'd never finish a full size one. I'm not entirely sure I'll wear Witches and Damned as they're a little out of my comfort zone but I've worn Ludwig, Lovecraft and Exorcism. I loved Ludwig and Lovecraft but Exorcism didn't last amazingly though I think that's because it's a darker shade and needed a bit more care and love. Okay, this lil fella wasn't strictly a January purchase, it was actually what my grandparents got me for Christmas from the wonderful Emily aka Black Labyrinth. She has some beautiful and original pieces for sale - from skulls to butterflies to beetles and even crystals. All of her work is one off pieces and she does take custom orders. Everything is ethically sourced and cruelty-free/has died of natural causes and absolutely stunning! Did you blag anything cool in January? Let me know! Sooo jel of the Kat Von D Lippie situation - such a good find. Witches is so pretty, do give it a try as it is quite wearable, it’s one of my faves. The coffin case is so cute too. Good haul! You got some cool stuff! Any plans to swatch the lipsticks? Not really because there's so many of them. I do wear them quite often though and post on my instagram if you'd like to look! Great post! The Kat Von D kit looks fab, I cannot believe you got it for that price! This is why I love Depop!